For those who did not want even the light degree of supervision exercised in a studio such as Gleyre's, there was the Academie Suisse — founded by a retired model of David's (presumably a Swiss) — which had no teaching but provided accommodation and a life model. This was attended by Cezanne, Guillaumin, Guillemet, Ludovic Piette, Pissarro and. for a short time, Monet. No other city in the world had as many art schools as Paris (in 1872 there were already twenty for women), and the city was awash with foreigners - mainly American, British and Dutch pursuing some kind of artistic curriculum. This was largely due to the fact that since the reign of Louis XIV there had existed an elaborate State system for the control and encouragement of art. So far as artistic education was concerned, in nineteenth-century France the most prominent feature of this system was the Ecole des Beaux-Arts, originally founded in 1648. Theoretically, entrance to the Ecole des Beaux-Arts was open to anyone of French birth aged between 15 and 30. But in reality nomination by a patron was necessary, and this was followed by an entrance examination. When Degas sat the examination in March 1855, he came thirty-third out of eighty; Renoir, who sat it in 1862, fared less well, coming sixty-eighth out of eighty. The crown of the official system was the Salon — originally the annual exhibition of the Academic Roy ale de Peinture et Sculpture, which was held in the Salon Carre of the Louyre. But in 1791 it was thrown open to all artists (at the same time the awarding of medals was initiated) and soon, because of the increase in the number of exhibits, a selection procedure had to be introduced. In 1848 the official jury system was replaced by a committee chosen by the exhibiting artists: but as this resulted in more than 5000 paintings being hung, the experiment was immediately discontinued. Various reforms, intended to liberalize the selection procedure, followed: for example, in 1852 Napoleon III decreed that half the seats on the jury should be given to artists. Nevertheless, the jury system continued to cause a great deal of resentment, culminating in the flood of complaints that led to the Salons des Refuses of 1863. Attendance figures were remarkable. The Ministry of Fine Arts estimated that in 1863 on Sundays, when admission was free, 30,000 to 40,000 people visited the Salon; and in 1876 the total number of visitors amounted to 518,892. No less significant was the coverage the Salon attracted in the press. The exhibition of 1863 was the subject of twelve articles by Ernest Chesnau in Constitutionnel and thirteen by Theophile Gautier in Le Moniteur universeh articles or drawings relating to it by Louis Leroy featured in eighteen issues of Le Charivari; and a total of 137 items appeared in other periodicals and newspapers, including the Fine Arts Quarterly Review and The Times in London. The monopoly exercised by the Salon was one of the main factors that impelled the Impressionists to band together. 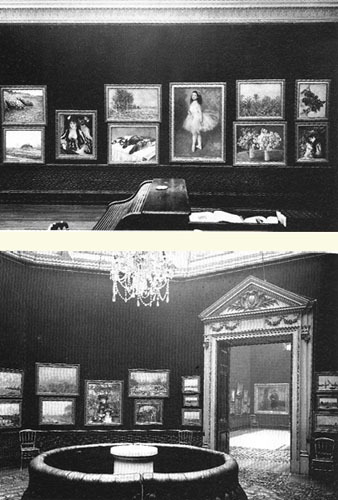 What they objected to about official art was not so much its style as its machinery: the fact that in the Paris of the 1860s the Salon offered the only outlet for little-known artists, and there were virtually no opportunities for them to exhibit their work in public without having to submit it to a jury. 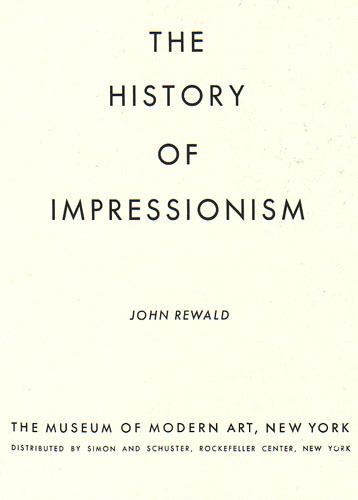 A vital tenet of the Impressionists' creed was that the artists who subscribed to their exhibitions should be free to show whatever they wanted to — and that, as a token of their independence, they would refrain from submitting work to the Salon. Nevertheless, this precept was honoured more often in the breach than in the observance — and even Monet, to whom it had been an article of faith, changed his mind in 1880, thereby earning the contempt of Degas and his followers. That the dominant role of the Salon should have at first united the Impressionists and then been a cause of disunity is an example of the pressures that provoked them to rebel against the conventions of the Parisian art world of their time. Personally unrebellious, shirking those eccentricities of appearance and attitude that the myth of Bohemia has imposed on the concept of the artist, the Impressionists were not strikingly different from their fellow citizens. Sometimes they were devious, especially towards Durand-Ruel and their patrons; sometimes disloyal to each other; sometimes parsimonious, but more often generous. They were all passionately devoted to their art, though usually less so to their wives or mistresses; and whilst they had periods of creative elation, they were also prey to depression. They did not see themselves through the eyes of posterity, and to understand them as people as well as artists it is necessary to reconstruct as far as possible the triumphs and tribulations of their daily lives as well as the history of their creative achievements. (b Albi, Tarn, 24 Nov 1864; d Chateau de Malromé, nr Langon, Gironde, 9 Sept 1901). 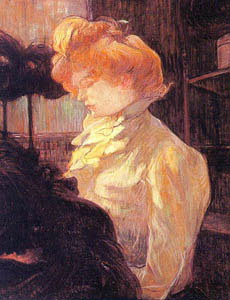 French painter and printmaker. He is best known for his portrayals of late 19th-century Parisian life, particularly working-class, cabaret, circus, nightclub and brothel scenes. He was admired then as he is today for his unsentimental evocations of personalities and social mores. While he belonged to no theoretical school, he is sometimes classified as Post-Impressionist. His greatest contemporary impact was his series of 30 posters (1891–1901), which transformed the aesthetics of poster art. (b Paris, 7 June 1848; d Atuona, Marquesas Islands, 8 May 1903). French painter, printmaker, sculptor and ceramicist. 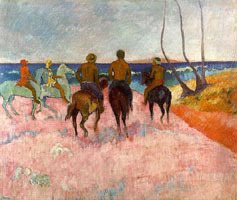 His style developed from Impressionism through a brief cloisonnist phase (in partnership with Emile Bernard) towards a highly personal brand of Symbolism, which sought within the tradition of Pierre Puvis de Chavannes to combine and contrast an idealized vision of primitive Polynesian culture with the sceptical pessimism of an educated European. A selfconsciously outspoken personality and an aggressively asserted position as the leader of the Pont-Aven group made him a dominant figure in Parisian intellectual circles in the late 1880s. His use of non-naturalistic colour and formal distortion for expressive ends was widely influential on early 20th-century avant-garde artists. (b Charlotte Amalie, St Thomas, Danish Virgin Islands, 10 July 1830; d Paris, 13 Nov 1903). 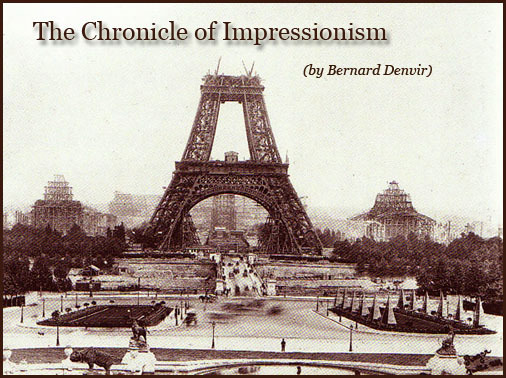 At the start of the new century the status of the Impressionists has greatly improved. 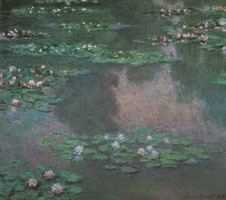 They are given recognition in histories of art, and monographs are written about them; their prices have stabilized; they are selling well in America (especially Monet); and they are represented in official exhibitions and increasingly in museums. (b Aix-en-Provence, 19 Jan 1839; d Aix-en-Provence, 23 Oct 1906). French painter. He was one of the most important painters of the second half of the 19th century. In many of his early works, up to about 1870, he depicted dark, imaginary subjects in a violent, expressive manner. In the 1870s he came under the influence of IMPRESSIONISM, particularly as practised by Camille Pissarro, and he participated in the First (1874) and Third (1877) Impressionist Exhibitions. Though he considered the study of nature essential to painting, he nevertheless opposed many aspects of the Impressionist aesthetic. 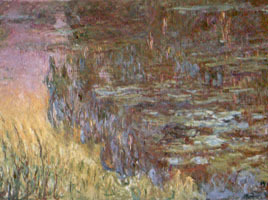 He epitomized the reaction against it when he declared: ‘I wanted to make of Impressionism something solid and enduring, like the art in museums.’ Believing colour and form to be inseparable, he tried to emphasize structure and solidity in his work, features he thought neglected by Impressionism. For this reason he was a central figure in POST-IMPRESSIONISM. He rarely dated his works (and often did not sign them either), which makes it hard to ascertain the chronology of his oeuvre with any precision. Until the end of his life he received little public success and was repeatedly rejected by the Paris Salon. In his last years his work began to influence many younger artists, including both the Fauves and the Cubists, and he is therefore often seen as a precursor of 20th-century art. -1906-Derain paints "The Port of London"
Durand-Ruel's exhibition at the Grafton Galleries in London in January 1905 marks the apogee of Impressionism as a contemporary movement. The three hundred or so paintings on show include most of the great works of its exponents, gathered in one place on a scale both unprecedented and impossible to repeat. 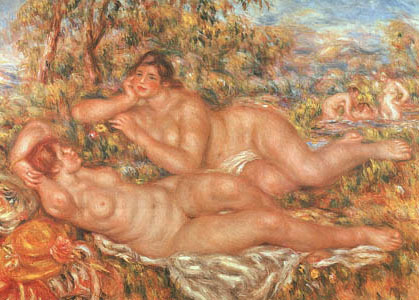 With failing sight, both Renoir and Degas turned to sculpture to express themselves and also to experiment with form. Degas had taken his first steps in the medium before 1870, and was greatly helped by his friend the sculptor Paul-Albert Bartholome. 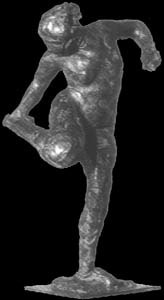 All his sculptures were modelled in wax, but during his lifetime only one of them, the Little Dancer of14 Years p. 126;. was cast in bronze. Visitors to his studio were surprised by the number of small wax figures that cluttered the place and by how. especially in old age, he would constantly play with them. After his death, the most presentable ones were cast in bronze. Renoir's interest in sculpture was aroused when Aristide Maillol made a bust of him at Essoyes in 1906. 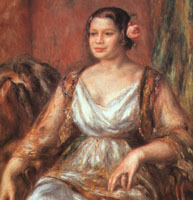 This had been commissioned by Vollard, and in the summer of 1913 he suggested that Renoir should collaborate with Richard Guino, who had been working as Maillol's assistant. Fourteen figures and bas-reliefs resulted from this partnership, including a clock case entitled Hymn to Life, a bas-relief version of Renoir's Judgment of Pans, a study of his wife with their son Jean on her knee, and several medallions of famous artists, including Cezanne, Delacroix, Ingres and Rodin. organized by Durand-Ruel at the Grafton Galleries, London. Among the masterpieces visible is Renoir's La Lage. The arrival of Manet's 'Olympia' in the Louvre and Renoir's 'Madame Charpentier and her Children' in the Metropolitan Museum of Art, New York, marks the final acceptance of the Impressionist movement into the official 'pantheon' of art history. 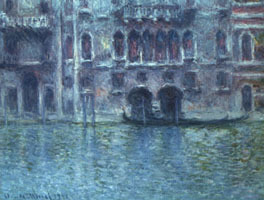 Palazzo da Mula at Venice. 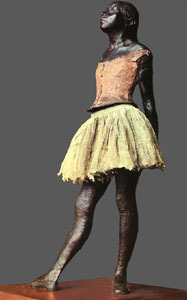 Several of the wax figures found in Degas' studio were of dancers in this naturalistic stance. Alice Michel, who posed for the artist in 1910, related that he worked excruciatingly slowly, and often had to start again when the waxes fell apart. The bronze above was first modelled in green wax, and the original wax for that on the right was destroyed. (b Paris, 19 July 1834; d Paris, 27 Sept 1917). French painter, draughtsman, printmaker, sculptor, pastellist, photographer and collector. He was a founder-member of the Impressionist group and the leader within it of the Realist tendency. He organized several of the group’s exhibitions, but after 1886 he showed his works very rarely and largely withdrew from the Parisian art world. As he was sufficiently wealthy, he was not constricted by the need to sell his work, and even his late pieces retain a vigour and a power to shock that is lacking in the contemporary productions of his Impressionist colleagues. (b Venice, 2 June 1841; d Paris, 30 Dec 1917). Italian painter. His father Pietro and grandfather Luigi tried to interest him in the plastic arts, but from a very early age he showed a stronger inclination for painting. Zandomeneghi soon rebelled against their teachings, and by 1856 he was attending the Accademia di Belle Arti in Venice, studying under the painters Michelangelo Grigoletti (1801–70) and Pompeo Molmenti (1819–94). As a Venetian he was born an Austrian subject, and, to escape conscription, he fled his city in 1859 and went to Pavia, where he enrolled at the university. In the following year he followed Garibaldi in the Expedition of the Thousand; afterwards, having been convicted of desertion and therefore unable to return to Venice, he went to Florence, where he remained from 1862 to 1866. This period was essential for his artistic development. In Tuscany he frequented the Florentine painters known as the Macchiaioli, with some of whom he took part in the Third Italian War of Independence (1866). Zandomeneghi formed a strong friendship with Telemaco Signorini and Diego Martelli, with whom he corresponded frequently for the rest of his life. In this period he painted the Palazzo Pretorio of Florence (1865; Venice, Ca’ Pesaro), in which the building, represented in the historical–romantic tradition, is redeemed by a remarkable sense of air and light, elements derived from the Macchiaioli. According to a letter written by Joseph Durand-Ruel in June 1919 to the art critic of the New York Herald, approximately 150 wax figures were found in Degas' studio after his death, many of them in fragments. The viable figures were entrusted to Paul-Albert Bartholome, who, in conjunction with Degas' heirs, sold the reproduction rights to the founder and art dealer Adrien Hebrard. In May 1921, the bronzes were exhibited at Hebrard's gallery and were widely acclaimed. The Italian founder Albino Palazzolo, who had done the casting, was awarded the Legion of Honour in recognition of his work on Degas' and Rodin's sculptures. The process used was quite complex. First of all moulds were made from the figures in order to produce working models in bronze, from which the final casts were taken using the cire perdue process. Working from the durable bronze models, it proved possible to make at least twenty-two casts of each figure. The price for a set of thirty bronzes was between 600,000 and 700,000 francs. One set was bought by Cassatt, who lent it to the Metropolitan Museum of Art, and the Louvre acquired a set through Degas' heirs. The original wax figures were bought by Paul Mellon in 1955, and the bronze working models by another American collector, Norton Simon, in 1976. 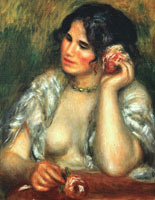 Impressionist works are being exhibited extensively in most European countries as well as in the USA and a surprising development is the enhancement of Cezanne's reputation, which stems from a reaction against the 'incoherence' of artists such as Monet. Despite the war and the death of Degas, Impressionism survives and the prices of Impressionist works continue to rise significantly. (b Limoges, 25 Feb 1841; d Cagnes-sur-Mer, 3 Dec 1919). French painter, printmaker and sculptor. He was one of the founders and leading exponents of IMPRESSIONISM from the late 1860s, producing some of the movement’s most famous images of carefree leisure. He broke with his Impressionist colleagues to exhibit at the Salon from 1878, and from c. 1884 he adopted a more linear style indebted to the Old Masters. His critical reputation has suffered from the many minor works he produced during his later years. (b Paris, 14 Nov 1840; d Giverny, 6 Dec 1926). French painter. He was the leader of the Impressionist movement in France; indeed the movement’s name, IMPRESSIONISM, is derived from his Impression, Sunrise (1873; Paris, Mus. Marmottan). Throughout his long career, and especially in his series from the 1890s onwards, he explored the constantly changing quality of light and colour in different atmospheric conditions and at various times of the day. (b Allegheny City [now in Pittsburgh], 25 May 1844; d Le Mesnil-Théribus, France, 14 June 1926). American painter and printmaker, active in France. Having settled in Paris, she became a member of the Impressionist circle. The quality of her draughtsmanship is evident in all the media in which she worked, notably pastel. 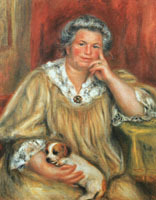 She is particularly associated with the theme of mother and child. (b Paris, 11 Nov 1863; d Paris, 15 Aug 1935). French painter, printmaker and writer. He came from a well-to-do family of shopkeepers. A visit to the exhibition of Claude Monet’s works organized by Georges Charpentier at the offices of La Vie moderne in 1880 decided him on an artistic career and encouraged him to try painting out of doors. His early works, landscapes or still-lifes of 1882–3 (Still-life, 1883; Berlin, Neue N.G. ), show an Impressionist influence, particularly that of Monet and Alfred Sisley. 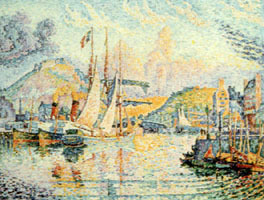 In 1883 Signac took courses given by the Prix de Rome winner Jean-Baptiste Bin (1825–c. 1890), but they had little effect on his style. Such suburban Paris landscapes as The Gennevilliers Road (1883; Paris, Mus. d’Orsay) place his works in a world of modern images comparable to those of Jean François Rafaëlli in which factory chimneys, hoardings and etiolated trees abound (e.g. Gas Tanks at Clichy, 1886; Melbourne, N.G. Victoria). 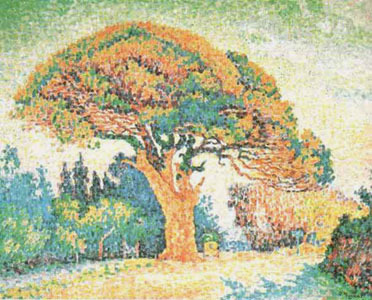 Already a friend of Henri Rivière, Signac soon met Armand Guillaumin, who provided important encouragement. In 1884 he was a founder-member of the Salon des Indépendants, where he met Georges Seurat who that year was exhibiting Bathers at Asnières (1884; London, N.G.). In this painting Seurat had already begun to apply principles of DIVISIONISM (although not yet the dot-like brushstroke), while Signac was still practising an orthodox form of Impressionism. (b Dorchester, MA, 17 Oct 1859; d East Hampton, NY, 27 Aug 1935). American painter and printmaker. The son of Frederick F. Hassam, a prominent Boston merchant, and his wife, Rosa P. Hathorne, he was initially trained as an apprentice to a wood-engraver. From the late 1870s to the mid-1880s he executed drawings for the illustration of books, particularly children’s stories. He had a long affiliation with the Boston firm of Daniel Lothrop & Co., for whom he illustrated E. S. Brooks’s In No-man’s Land: A Wonder Story (1885), Margaret Sidney’s A New Departure for Girls (1886) and numerous other books. Once seen as a new and revolutionary art form, Impressionism has now become virtually the art of the establishment - its leading position in the avant-garde having been taken over by Cubism, Surrealism and other movements. But due to improvements in education, printing and reproduction processes, and exhibition facilities, it is beginning to attract a larger public than any of its predecessors. With the deaths of the last Impressionists - Cassatt, Monet and Guillaumin - the final active phase of the movement draws to a close. A number of important bequests enrich the major museum collections. 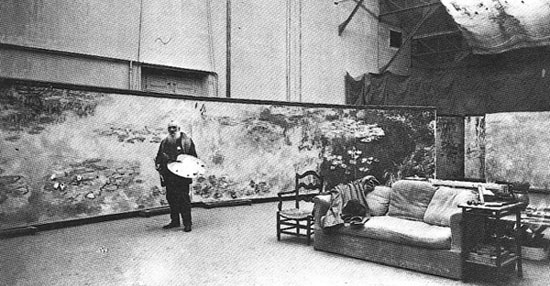 A photograph of Monet in his third studio at Giverny (c. 1924 -25), in front of the Nympheas panel Morning. long and 2m (6ft) high. He decided to offer the work to the nation through Clemenceau, provided that it was displayed suitably and that the government bought his Women in the Garden (1866). Unfortunately Clemenceau lost the elections of 1920, and the project became increasingly tortuous. In September 1920 it was suggested that the panels should be exhibited in a pavilion in the grounds of the Hotel Biron. Finally, Monet having been paid 200,000 francs for Women in the Garden, it was decided in June 1921 that the panels would be hung in specially adapted rooms in the Orangerie. Nine months later a formal agreement was signed by the artist and the Director of Fine Arts. In 1925 Monet visited the Orangerie to inspect the gallery, but he continued altering the panels until his death in 1926, and the gallery was not opened to the public until May 1927. This panel shows the evening light reflecting in the dark shadows of the pool. It hangs in the first of the specially adapted rooms in the Orangcric between Morning and Clouds.